Sean Miller led his team (l-r) Matt Regatuso, Tyler Fuller, and Matt O’Connor to a silver medal in competition. 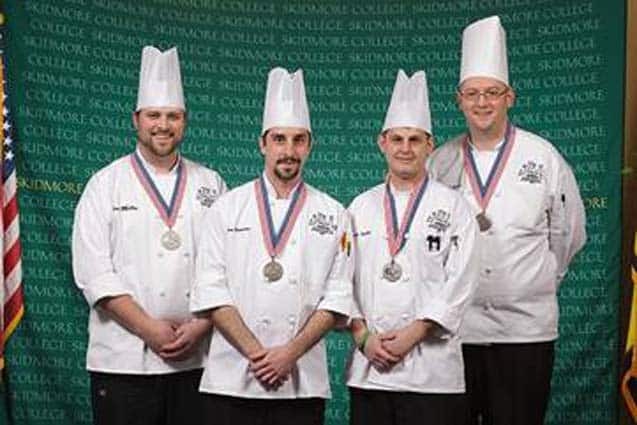 KILLINGTON–Foundry Executive Chef Sean Miller and his team took home a silver medal at the recent American Culinary Federation Competition, held Jan. 6-8 at Skidmore College in Saratoga Springs, N.Y. The fifth annual ACF-sanctioned event brought in food service chefs from colleges, country clubs and restaurants throughout the Northeast. Chef Miller’s team was one of 11 to compete in the invitation-only event. Each four-person team was given a surprise market basket filled with seasonal products and ingredients, and required to design and prepare an original three-course menu. Competitors had just two hours to execute and present their creations. Teams had an additional hour to prepare a buffet platter for ten people. The judging panel included two ACF-certified master chefs. Dishes were judged for originality, taste, and presentation, with points awarded for teamwork, culinary skills, and sanitation. Teams were allowed to use only four portable butane burners to prepare the first two courses of their menu. For the dessert course they were allowed only an oven and a freezer. Appetizer course: Pan-seared hake with chilled beluga lentil and avocado salad with plum vinaigrette, compressed plums, micro-green salad and herb oil. Entrée course: Pan-seared teres major, celery root puree, creamed Brussels sprouts, bacon and mushroom relish, warm fingerling potato salad, oblique-cut demi glacé carrots and celery root chips. Dessert course: Hazelnut cake with a blood orange glaze, blood orange and pineapple sorbet, hazelnut crumble, chocolate and blood orange sauce and pineapple chips. Buffet platter: duck roulade, spinach and pistachio duck mousseline, oatmeal stout-infused farro, pan-roasted acorn squash, haricots verts, whole roasted cipollini onions, sautéed Portobello mushrooms, and crispy duck skin with a reduced duck jus.